Fitted with two of the most popular charcoal teeth whitening products, get the ultimate shine with Bianco Smile’s ultimate charcoal pack. Bianco Smile’s activated charcoal is made from natural and organic ingredients which act as a deodoriser, purifier and detoxifier for your teeth and gums; leaving you with healthy white teeth. By using both the charcoal toothpaste in addition to activated charcoal powder, you will guarantee fast teeth color improvements and prevent bacteria and plaque build-up. Alternate between each charcoal whitening solution. Provide oral hygiene for tooth and gums. Long-lasting results (1-3 months) depending on usage. Activated Charcoal Powder: Activated Coconut Charcoal, Sodium Dodecyl Sulfate, Calcium Carbonate, Allantoin, Menthol, Citric Acid, Natural Sweetener, Coconut Oil. Charcoal Toothpaste: Sorbitol, Calcium Hydrogen Phosphate, Silicon Dioxide, Glycerin, Sodium Lauryl Sulfate, Menthol, Carboxymenthyl Cellulose Sodium, Saccharin Sodium, Activated Carbon. 1) Alternate: Each day alternate between your charcoal toothpaste and activated charcoal powder. 2) Dip: Dip your Toothbrush in your charcoal powder or toothpaste. 3) Scrub: Scrub your teeth, covering all surface area of your upper and lower teeth. 4) Rinse - Once you are finished scrubbing, rinse out your mouth thoroughly. 5) Smile - You're on your way to whitening your teeth, and giving yourself a brighter, Bianco Smile! Tried it and you must try it too! 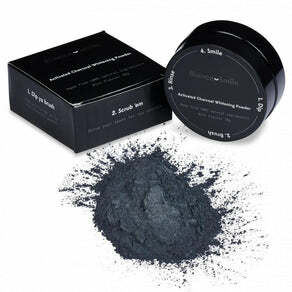 I was really excited to try the Activated Charcoal Whitening Powder, and amazed at how well it works. It doesn't have much of a taste at all. A little goes a long way. I am not using it everyday because I have sensitive teeth and I am worried about using it too much, but otherwise it is a great product and my teeth are already a couple shades whiter. This is really easy to use, tastes fine and has already whitened my teeth considerably. I have only had it a couple weeks and use it every other night.